"Pilot" -- Academy Award winner Robin Williams returns to series television in THE CRAZY ONES, CBSÃ¢ÂÂs new single camera workplace comedy about a larger-than-life advertising genius whose unorthodox methods and unpredictable behavior would get him firedÃ¢ÂÂ¦ if he werenÃ¢ÂÂt the boss. Simon Roberts (Williams) is the head of a powerful agency, with the biggest clients and brands in the world, but even more important to him is that his daughter Sydney (Sarah Michelle Gellar) is by his side. THE CRAZY ONES will premiere this Fall, Thursdays (9:00-9:30 PM ET/PT) on the CBS Television Network. Photo: Richard Cartwright/CBS ÃÂ©2013 CBS Broadcasting, Inc. All Rights Reserved. My take: Robin Williams is a captivating performer, and that can be either a good thing or a bad thing when it comes to an ensemble piece. I was surprised how well the entire group worked together in the pilot; James Wolk in particular is impressive. Plus, Kelly Clarkson guest-starring in the pilot? Yes, please. 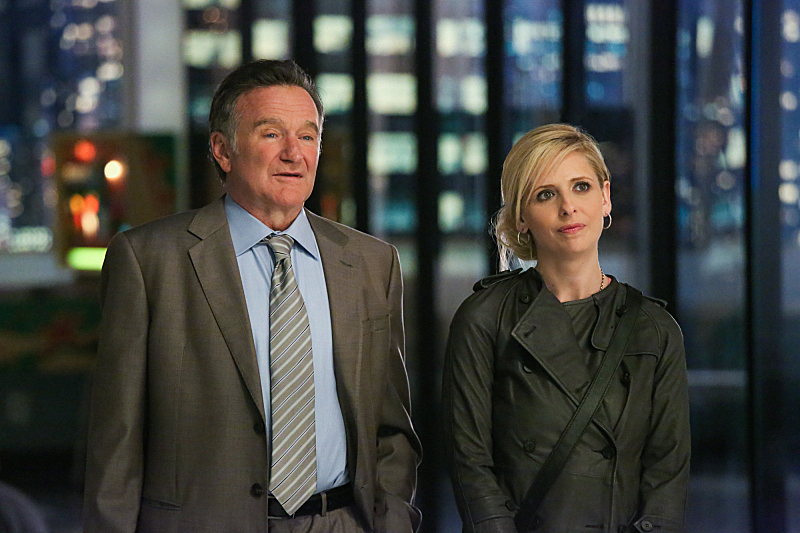 THE CRAZY ONES premieres tonight at 9 PM on CBS.